I was contracted to work with various organizations to help with their fundraising. The idea of the fundraiser was to create an Oil Painting of their choice for the purpose of reproducing the image into limited edition prints for sale by the fundraising group. The image was a collaboration between the Artist and the Fundraiser Committee to produce an Original Oil Painting depicting the image chosen. Once the image has been decided, the Artist drafts a linear drawing to scale and obtains final approval from the Fundraising Committee before proceeding with the Original Oil Painting. This is the time any revisions or changes to the image must be made. Upon approval of the drawing, the Original Oil Painting commences. The Fundraising Organization is under no obligation to purchase the Original Oil Painting, however all of the paintings I was contracted to do were purchased. 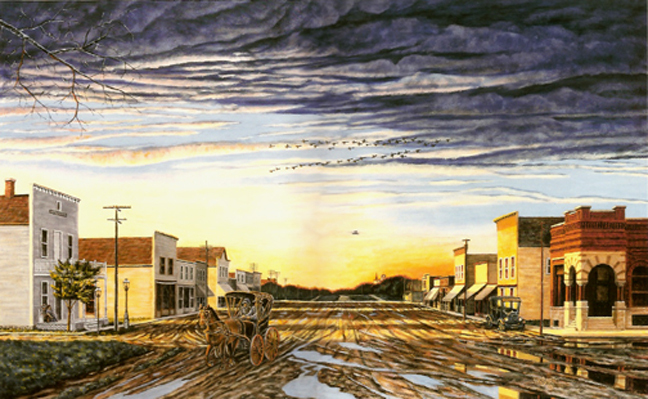 Some of the organizations sold the Original Oil Painting to private individuals, others auctioned and/or raffled the Painting, and others were purchased by the Fundraiser Organization to be displayed in one of their Public Buildings, such as their Community Library; City or County Offices. The success of the Fundraising Organization is dependent upon the willingness of their volunteers to selling the limited edition prints. Of the groups I worked with, the average number of prints sold was approximately 165. The number of prints sold ranged from approximately 125 to more than 350. With respect to the Original Oil Painting and the Limited Edition Prints and for the details for division of the proceeds between the Artist and the Fundraising Group, please feel free to ﻿contact us﻿, and we will be happy to visit with you. 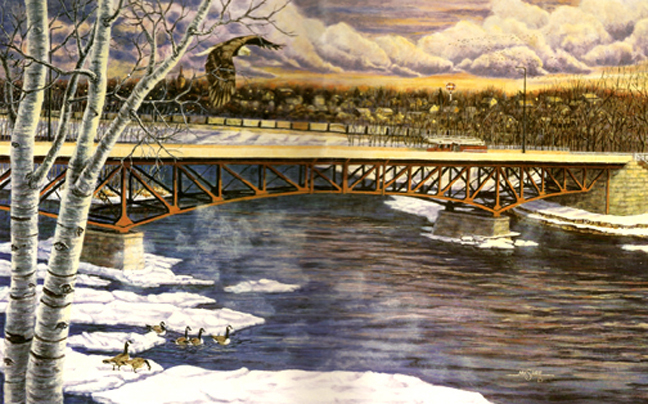 This painting was created for the Sauk Rapids Volunteer Fire Department to commemorate the bridge in their community that was scheduled to be replaced. They wanted one of their fire trucks to be part of the painting as well as a bald eagle and Canadian Geese. The town of Sauk Rapids, MN is represented in the background. 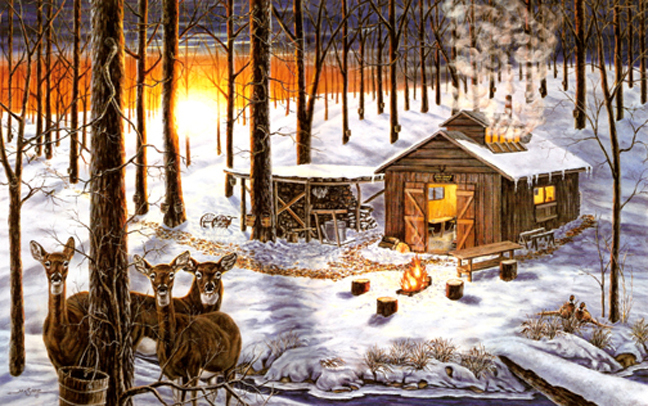 This painting of the Sugar Shack was created for the Kossuth County Pheasants Forever organization. Near the town of Algona, IA this building can be found nestled in the woods, and every year when the maple trees are ready, the sugar shack comes alive with the production of maple syrup made the old fashioned way. 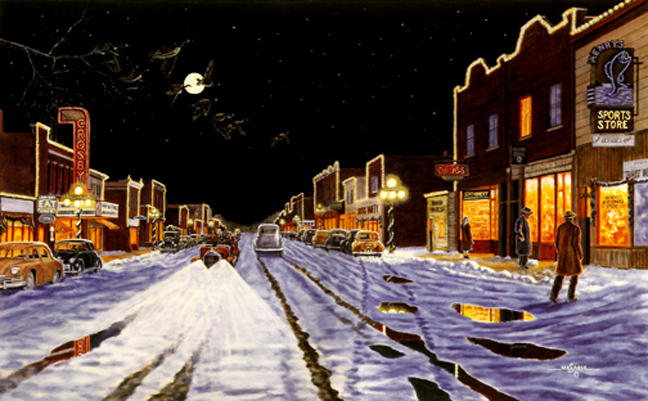 This scene from yester-year was created for the Frost Area Community Club in Frost, MN. The group wanted to bring back to life a photo they had of their town at the turn of the last century. The muddy street must have been difficult to navigate. 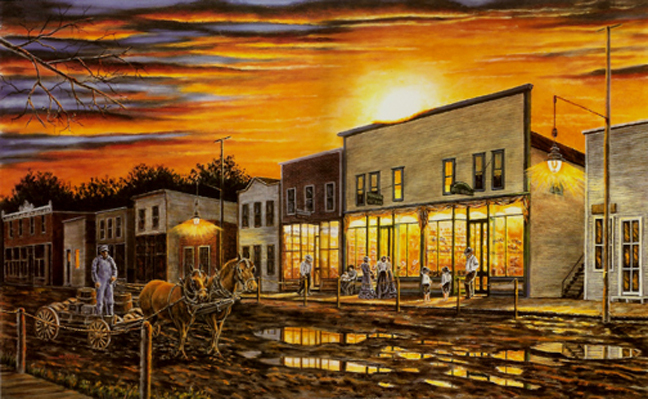 This painting was created for the Schleswig Centennial Committee to raise funds for their Centennial celebration. With several photos of their down-town area I was able to create the scene showing the ending of a festive Fourth Of July celebration. Night Lights was created for the Winding Stairs Festival held each year in Traer, IA. They wanted their beautiful downtown buildings depicted in a modern day winter scene showing how they decorate for their Christmas holiday. Caring Partners was created for the Iowa Emergency Management Association (I.E.M.A.) to show the aftermath of what is all too often a common occurance in the Midwest. This organization wanted all of the first responders to be represented: Fire and Rescue, Police, County Sherrif, HAZMAT, Helicopter Rescue, Firefighters, Rescue Dog. The scene depicts an overturned semi on fire and an unknown liquid substance leaking with the first responders on site; damaged trees, cornfields, barn and buildings damaged by the tornado. 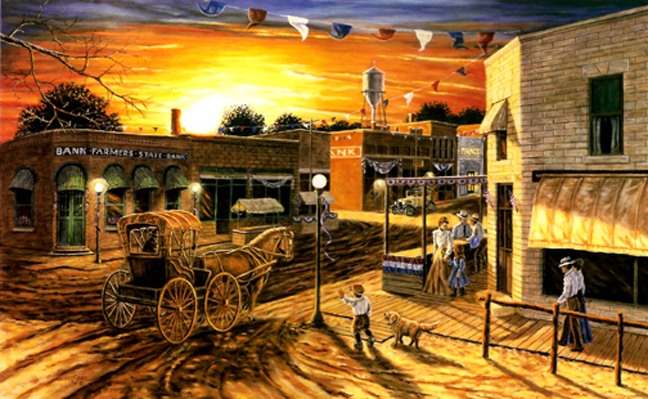 Vesta Vision was a painting for the Vesta Centennial Committee to depict their town. The group had one photo of their town and wanted it re-created as it was in the photo. It was my job to try to bring to life the town of Vesta, MN as it would appear on a late summer afternoon. 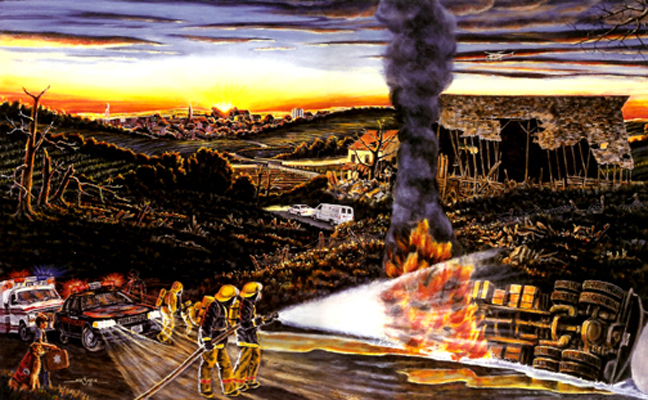 This painting was created for the Crosby Fire Department. 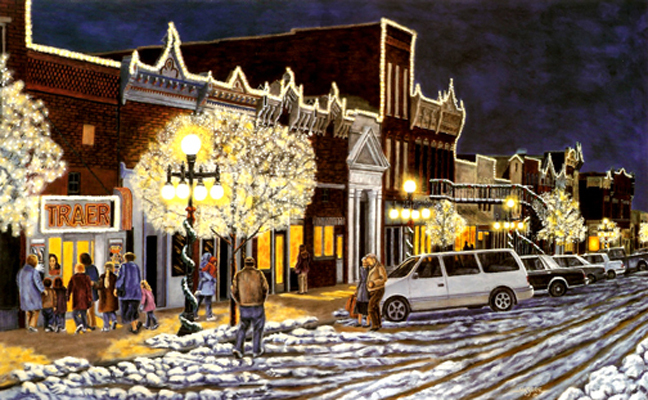 They wanted a painting showing their downtown during the Christmas Holiday to show-case the beautiful downtown buildings of Crosby, MN, and their prized antique fire truck, so the scene was placed in the mid 1940's. They also wanted canadian geese to be flying over the town. 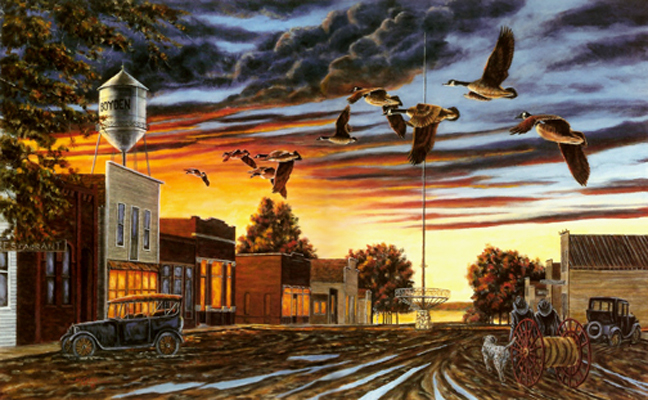 The Boyden Area Fire Department wanted to have their town of Boyden, IA re-created to the turn of the last century set in the fall season with canadian geese flying over the town. They also requested the town's first firefighting apparatus be a part of the scene, and as with most fire departments, they are not complete without a dalmatian by their side. 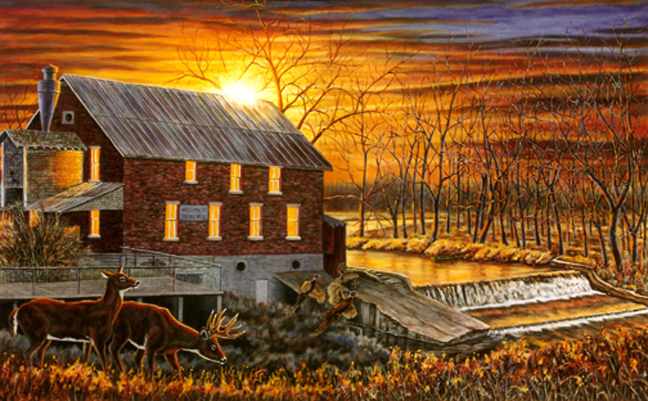 This painting was sponsored by the Upper Iowa Pheasants Forever Group of one of their landmarks, the Lidtke Mill. Not unlike most of the small towns in the midwest, there was a very productive mill, often the centerpiece of the towns. This mill is now an historic landmark and is a draw to tourists. 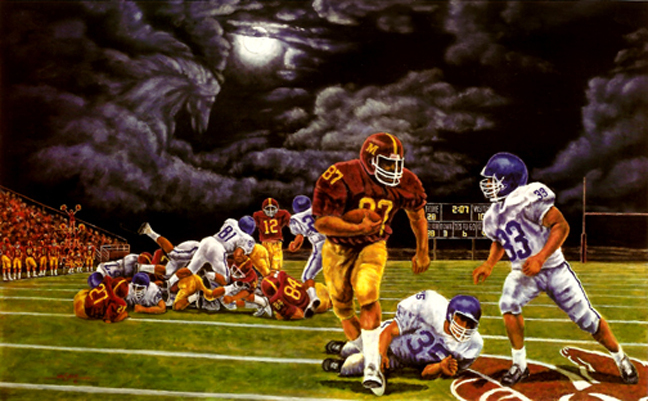 This painting was created for the High School A-R Drill Team as a fund-raiser for their school. They wanted their beloved "Mustang Football Team" to be depicted in the middle of the big game. The "Mustang" logo is depicted on the turf in part, and can also be seen as a formation in the cloudy sky. This painting was the second painting created for the Frost Area Commun-ity Club. This time, however, they wanted a more modern day scene of their downtown showing the transformation of their town. Oh, how nice it is to have paved streets. 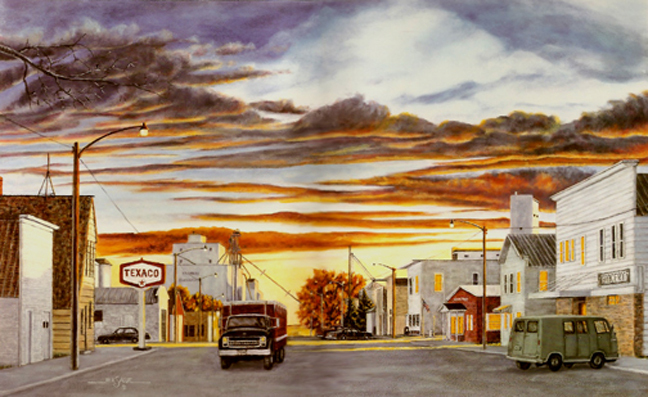 The scene is set in the mid 1950's as the sun is setting in the fall season, where the grain elevator is about to become the center of attention in the town. Copyright 2013 Simply Brie. All rights reserved.